Is it just me or is silver jewelry making a comeback? Maybe it's the economy, but I'm seeing more of it these days and I'm liking what I'm seeing. To be honest, I haven't worn silver since high school. Mostly, this is because I don't like polishing it. When I got married, visions of silver polish kept dancing in my head and in the end I didn't even register for silver place settings. I guess I'm more of a pragmatist than a romantic! So it's a major turnaround for me that lately I've dug out all my nice silver things and put polishing cloth to necklace and rings alike. Lately, I'm seeing some really lovely and delicate designs in the stores – the kind of things you used to only find in white gold. In the hunt for bargains, these pieces are looking quite appealing. 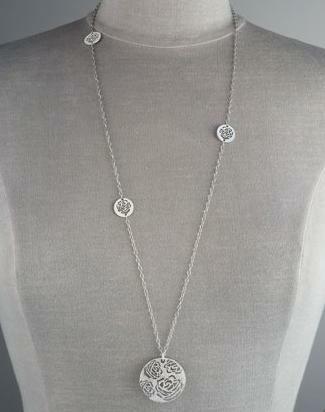 This gorgeous Rose Charm Necklace from Pianegonda would look great with just about everything. And for the price of a bi-annual silver cleaning, it could a great gift for a thrifty pragmatist! Photo above is from NeimanMarcus.com. Amedeo Scognamiglio's family has practiced the art of carving cameos for five generations. His mother, Marisa, pencils sketches on shells as templates for the carvers. 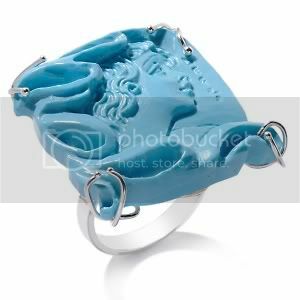 His company, M+M Scognamiglio, is the world's largest manufacturer of handmade cameos, and it has evolved into an impressive brand. Every cameo is a one-of-a-kind masterpiece, handcrafted by highly skilled artisans from a single, two-layer shell. The layers provide subtle depth and shine, composing delicate feminine silhouettes and romantic imagery. 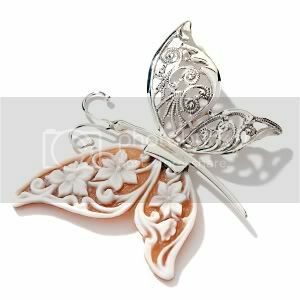 The butterfly-shaped pendant reveals a hand carved sardonyx (approx. 44mm) that has floral designs on one wing, and open, filigree-adorned sterling silver metalwork on the other wing, with a sterling silver body and antennae. Oval pink conch stone stations alternate with slightly larger, oval pink conch stone stations (approx. 14 and 16mm) along the bracelet, separated by x-shaped metalwork links. Measures approx. 7-1/2"L x 11/16"W.
Hand carved, square simulated turquoise (approx. 25mm) reveals the captivating profile of a woman whose locks are beautifully integrated into the stone's shape. Measures approx. 1-1/16"L x 1"W x 1/4"H; shank 1/8"W.
Amedeo was standing in his father's workshop, located at the scenic Mount Vesuvio in Naples, Italy, when he carved his first cameo. He was 16 years old. Upon earning his law degree in 1997, Amedeo moved from Italy to New York to oversee the company's U.S. operations. His work soon grew in popularity, appearing in Vogue, W, Elle, Marie Claire, Women's Wear Daily, Gotham, InStyle, UsWeekly, Town & Country, Oprah, New York Magazine, Philadelphia Style, and a host of other fashion magazines. His work has adorned celebrities like Ivana Trump and Sarah Jessica Parker. Lorenzo searches the world for the liveliest, brightest, and most beautiful natural stones, obtaining raw materials directly from mines in some of the most exotic places around the globe. Inspired by art and by nature, Lorenzo's designers create jewelry that frames these stones in styles that are both current and timeless. Crafted from sterling silver and accented with artistically carved pieces of 18K gold, these styles are then set with the uniquely cut gemstones. Discover their radiant, checkerboard, and concave cuts, and see how they maximize the brilliant color of these vivid gemstones. 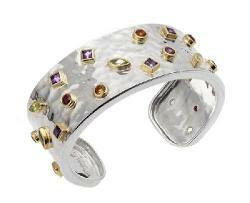 They also have beautiful pieces made with just sterling silver and 18K gold. Lorenzo designs embody an artistic passion for sterling silver jewelry. A passion which differs from most because of its unique contemporary styling using accents of 18 karat gold. This pairing of silver and 18 karat gold distinguishes these designs and creates the perfect setting to showcase the world's most exquisite gemstones. These stones are hand-selected for their vibrant color, exceptional faceting, and superb quality. All the colors of the most exotic gems is the underlying theme of the creations from Lorenzo Jewelry: amethysts, citrines, garnet, blue topaz, peridot, but also rhodonite, and tanzanite. Jewels that alternate the power of gold with the simplicity of silver in a wide selection of pieces made both by avant-garde machinery, as well as by traditional methods to the client's specifications. The styles offered are diverse, fashionable, classical, and retro to satisfy all segments of the market. In its two facilities in China, Lorenzo Jewelry has developed a lost-wax process that is able to produce jewelry in great quantities, and complex setting techniques like channel setting. Thanks to both the skill and the experience of its partners, virtually all production is destined for export; currently its primary market is North American, but plans for the future include Europe, Japan, Australia, and China. Corazon Latino, the jewellery company famed for its high quality, wearable jewellery has bucked the trend for cutting back in the light of the current recession, and launched a fabulous new range for Summer 2008. The new range includes some exciting new silver bracelets and stunning silver necklaces which combine with dainty earrings to create real sparkle. For the first time, they have also added Amber to their range, with 4 incredible silver pendants combining natural Baltic amber set within handmade silver cages. Available in 3 beautiful colours (Honey, Milky and Forest), every pendant is unique. Corazon Latino sells their beautiful silver jewellery exclusively online. With over 80 designs in total ranging from $50 to $500, and worldwide delivery within 7 working days, they offer something for everyone. The Pure Collection created by Hot Diamonds is an interesting twist on diamond jewelry. Normally, diamonds are teamed up with some of the higher end metals such as gold and platinum, but this collection includes a combination of sterling silver and sprinkles of diamonds set throughout the various designs. To add a little somethign else extra, the company limits each piece to a production of 925 – as in 925 silver – get it? Of course, I can't help but think if they had gone with pure silver, which considering the name it seems a little odd that they didn't, would there be a limited edition of 999? But, still, a cool idea. Also, they've rhodium plated the pieces, so this cuts down on tarnish, a major issue with silver jewelry, especially sterling silver jewelry. You can see a lot more of the collection on the company's site; however, here are a few pieces I picked up for you, a ring, pendant, and bracelet. The Lyric sterling silver jewelry collection by Frederick Goldman is full of all kinds of intricate details that suggest some carved the designs into the metal. Of course, that's not how they were made, but it's more than just filigree here. With the addition of oxidizing the metal, it makes the reliefs pop out of the jewelry piece. 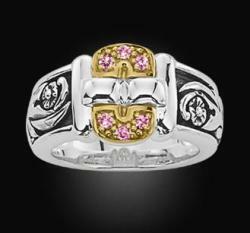 For example, pictures left is a ring with pink sapphires and 18kt gold accent. 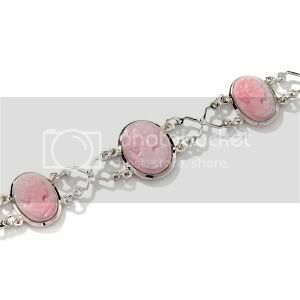 This is the sort of sterling silver jewelry that you don't want to do too much cleaning to because you can end up taking off the dark oxidized areas and totally changing the look of the piece. They site suggests just using a polishing cloth to rub it down now and then. My design philosophy is simple: make pieces that reflect the strength, beauty and individuality of its wearer. I like to make pieces that are off-the-beaten path and incorporate the cultures and colors of the exotic places I've travelled. I live in Colorado-and there is plenty if inspiration here, too. From the rich earthtones to the vibrant hues of a blue sky or tangerine sunset, my pieces also reflect Colorado's ever-changing natural surroundings. From the hand-forged silver pendants to the contemporary sterling silver designs tarnished by my own hands, I believe that details do make a difference. I choose only high-quality materials and semi-precious gemstones and prefer handcrafted components made by skilled artisans from around the world. The last two lines of my favorite poem by Robert Frost touts the virtues of listening to the little voice that urges all of us to try something new, something original. "Two roads diverged in a wood, and I- I took the one less traveled by," the poem declares, "And that has made all the difference." My goal is to take a few unexpected turns along the way. My designs reflect that philosophy, too. Each piece in my collection is made with passion and creativity, and each piece tells a story. I look forward to sharing these stories with you. Granted, I'm a sucker for anyone who quotes poetry, but even without that, I find her jewelry work unique and very wearable. Pictured above are her Pearl Waterfall Chandeliers: Beautiful and delicate white Freshwater pearls cascade in varying lengths like a frothy waterfall spilling over the edge of a canyon. 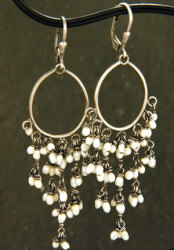 The pearls are secured to handmade hoop style earrings made in Bali and finished with a leverback earring wire. Earrings measure just shy of 3 inches long and all sterling silver components-including the wire-has been gently oxidized and rubbed out by hand for depth and drama. These bracelets, which she calls Margaritaville Leather Bangle Set, have leather straps and include Chinese turquoise stones and orange carnelian. Finally, here's her La Puerta Fine Silver Necklace, made of sterling silver and tourmaline. Thistle & Bee maintains a longstanding reputation as a producer and purveyor of fine heirloom quality sterling silver. Our full range of sterling silver products incorporate designs both classic and contemporary, with styles both whimsical and sophisticated. We take great pride in our ongoing commitment to superior craftsmanship and quality. Each Thistle & Bee offering is carefully assembled in dedicated production facilities around the globe, using only the finest materials available today. We will continue to provide our customers with sterling silver goods that excite their tastes, and personalized customer service that meets their needs. I was especially impressed with all the cuff bracelets they carry. The sterling and gemstone cuff pictured top/left has amethyst, rhodolite and peridot set in 18K gold vermeil bezels across the silver base. Here's their oval swirl cuff – open designs are great for showing off a little skin. This honeycomb texture cuff has a 18K gold vermeil bee.